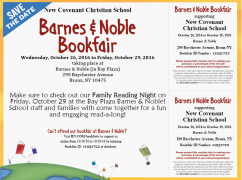 We’ll be hosting a book fair at Barnes & Noble in the Bay Plaza Mall, located at 290 Baychester Avenue in the Bronx. The dates of the book fair are October 26, 2016 to October 29, 2016. 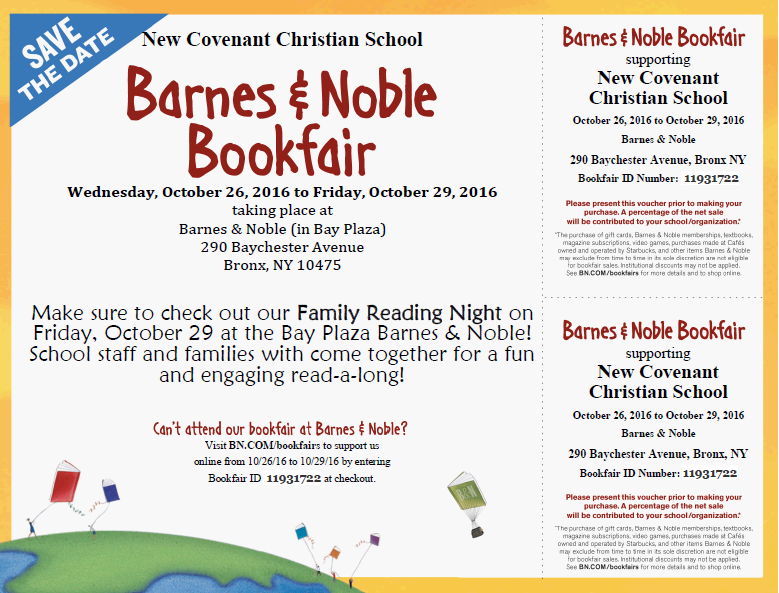 The Family Reading Night will be held on October 29, 2016 at the Bay Plaza Barnes & Noble. How does the Book Fair benefit you and your family? Reading is an important foundation for all learning, but it can also be great fun for children and adults alike. By participating in the Book Fair, you’ll get access to engaging reading material that, with your support, will help to improve your child’s literacy. Need ideas about how to encourage your child to read more? Click here. Looking for great books for your child to read? Click here. Remember, a family that reads together succeeds together! How does the book fair benefit the School? When you make a purchase at any Barnes and Noble (even online at www.bn.com/bookfairs) using our Book Fair ID #11931722, NCCS receives a portion of the proceeds. Anyone can use this Book Fair ID # to make purchases, even if they don’t have a child in our school. So feel free to pass this information,and the Barnes and Noble voucher here, on to your friends and family members. We depend on fundraising as a not-for-profit school, so please come out and show your support and encourage others to do so as well. We appreciate you!